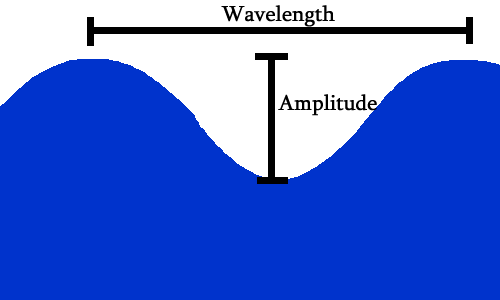 The wavelength is the length from crest to crest, and the amplitude is the distance from the bottom of the trough to the top of the crest. The period is the length of time for one crest to travel the distance to where the other crest was. 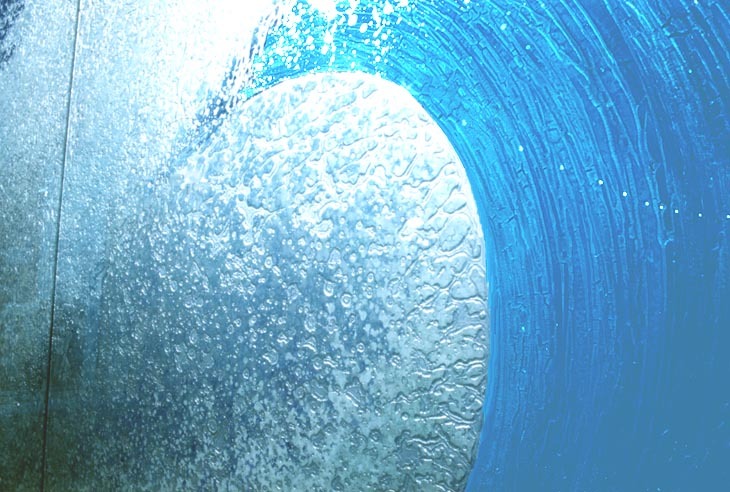 A vertical displacement in the water column at sea creates waves that become tsunamis. While at sea these waves have a VERY large wavelength (approximently 500 kilometers), but their overall amplitude is very small (about a meter). In the ocean, a tsunami could pass beneath the boat that you are on and you would hardly notice it! Because of the very large wavelength, the wave loses very little energy as it moves along the ocean, thus allowing tsunamis to inflict damage hundreds of miles away. As these waves approach the shore, they start to behave differently (like shallow water waves instead of deep water waves) and their wavelength becomes smaller and the amplitude becomes much taller. The picture above clearly illustrates the wavelength becoming smaller and the amplitude rising suddenly. The position of a wave is defined as x(t) = A cos(ωt + φ) where A is the amplitude, ω is the period, and φ is the phase constant. The velocity of a tsunami is dependant on only one factor: the depth of the ocean over which it is traveling. The maximum velocity of a tsunami can be up to 800 kilometers an hour. Thus the velocity is equal to the square root of g (gravitational constant 9.81 m / s^2) times the average depth of the ocean. This method was used estimate the average depth of the ocean between Hawaii and Alaska in 1856 before the advent of sonar and modern depth techniques. 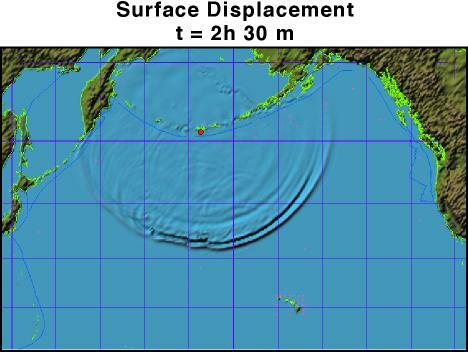 The scientists knew the amount of time it took for the tsunami to reach Hawaii from Alaska, and also the distance, so they thus knew the velocity. Since g is already known, they simply solved for the average ocean depth. Another factor in the creation of tsunamis is the depth of the earthquake. 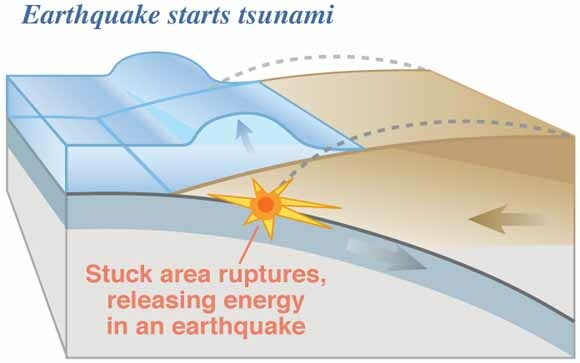 If the earthquake occurs more than 100 km below the surface, a tsunami will not occur because there is not enough vertical displacement of the water. These images show how the tectonic plates collide creating an earthquake and a vertical displacement in the water. 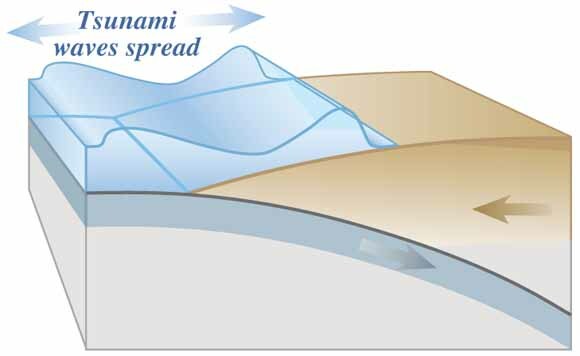 As can be clearly seen from the picture above, tsunamis extend radially from the source of the earthquake, much as if a pebble had been thrown into a pond.